Meerkat just made real-time video more interactive, unveiling a feature today called Cameo that lets users invite friends on the mobile app to take over their livestream. And it seems to have a lot of branding potential. Users can tap on a viewer's profile and encourage him or her to view their stream, or they can alert a viewer with a comment by tagging that person as follows: "Cameo @username". Cameo then lets the invited viewer take over the stream for up to 60 seconds, and his or her Twitter followers and Facebook friends are alerted about the stream. Both people can end the cameo at any time, at which point the video returns to the broadcaster who started the stream. Cameo seems ripe with real-time marketing possibilities. So, the question probably isn't if brands will use the feature to work with influencers or celebrities but when. 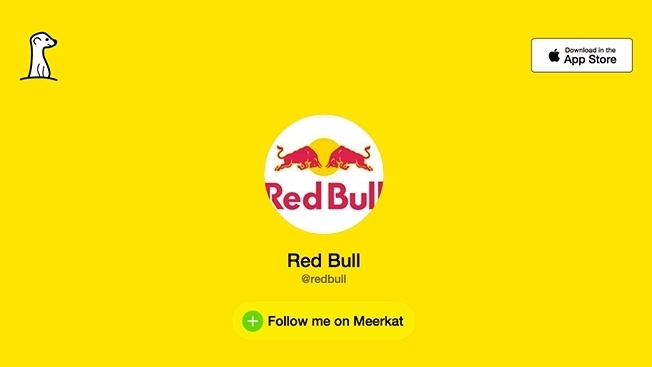 For instance, Red Bull, an early player on Meerkat, may want to work with its roster of sponsored extreme-sports athletes for interactive efforts. The beverage company—or other marketers—could tease upcoming livestreams with "And Very Special Guests" copy to lure folks to their virtual events. UPDATE: Meerkat has now disclosed that several marketers have begun using Cameo, including The Weather Channel, TMZ, Fox, CW, Southwest Airlines, Applebee's, Hulu, Refinery29 and Michelle Phan.